Is there any reason why they can't have coach numbers rather than coach letters? Where 1 is the front of the train and 5,9,10 is the end, especially as they are no longer using semi-permanent labelling on carriages. It would stop nonsense such as (Zones 1 to 5) A B C D E - L K J H G (Zones 6 to 10) which most people would struggle to work out while stood on the platform. I appreciate front of the train maybe an issue for XC at Reading or Cardiff-Portsmouth services at BTM, but for most services this would work. Is the use of letters a limitation of the reservation system or will it change when HST's are no more? Since the internal layout of the coaches is not identical (first class etc) it will still be necessary to identify reservations by coach letter which is independent of the actual train configuration. Yes I realised that this wouldn't work, just after I posted it, due to trains not always being in the correct formation. Asking somebody to look for Coach 3 in zone 7 is probably worse than asking them to look for Coach C in Zone 7. By this morning the orange squares has spread all over Reading Station, and this evening I heard (not entirely audibly, volume rather low) reference to zones in some announcements. I agree with Grahame's initial assessment - there seems too much information to take in at one go, and I expect it will bewilder rather than help those who are not regular passengers. I'll post further if there's anything relevant to report. On the other subject I raised, I noticed this morning at Wokingham that arrival times at onward destinations were also being shown in the middle band of the platform dot matrix signs here too, although presumably this is an independent SWT installation instead of NR. A setup similar to this has been in use by SNCF for as long as I have been travelling regularly by train in France although, if I recall correctly, it relies purely on platform mounted digital displays rather than audible announcements. Obviously I stand to be corrected. There are posters up at Reading explaining the change, though from the quick glance I got at one yesterday, I swear it said "to be introduced from December 2018". The use of zones does seem a little haphazard. They seem to be used in most announcements for Inter City services, and as well as being used on some platform arrival signage, they are now on the signs at the top of the stairs/escalators on the overbridge - see below for an example. There are though some shortcomings. This is one of three messages that constantly change at about 5 - 10 second intervals, the first being the usual time/destination/calling points (which can run to two screens on longer journeys), the second being a general announcement (currently letting you know that there may be amendments to services over the holiday weekend, without further details) and the zonal message. I think that the information is too much to absorb in the brief view you get. Someone unfamiliar with the station and these signs is not going to know that it will be a fleeting view, nor are they going to wait to see if the message going to come around again, especially if they have little time to get down to the platform to catch their train. Furthermore they are above most people's sightline. Ironically, there are some large and prominent signs at a convenient level on the overbridge - see the third picture below. the advertising company JC Decaux has installed electronic advertising signs at platform level. 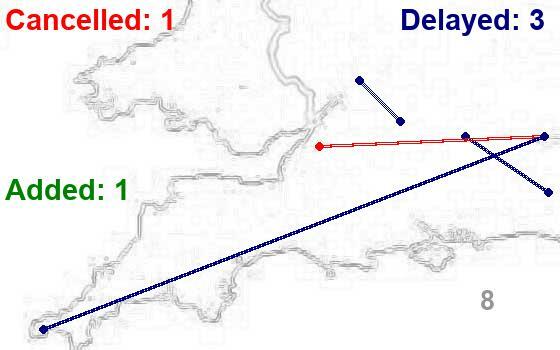 Could National Rail see if they could arrange something for train information - a fixed not rotating view, and preferably black on white, not dot matrix - with the destination/stopping points and zonal information? As far as I can tell, zonal information seems only to be used for Electrostar and IET services. It is still not universal, and there is one service where it might be most useful and it is not used. One train I sometimes catch is the 18-57 departure from Reading, all stations to Didcot. It arrives as a 12 coach train from London on platform 13, the rear 4 are detatched (which invariably takes longer that the timetable allows!) before it departs. Clearly it would be useful for signage to tell the passenger that the coaches in the rear zones should not be used. However even though the signs on platform 12 (the other platform face opposite 13) has full zonal information, the platform 13 sign simply tells you to listen to on-train announcements! Overall, the initial impression that currently there is an information overload problem has been confirmed. It needs to be addressed as part of a more general overhaul/improvement of station signage at Reading - and presumably elsewhere. It could though be a useful feature if developed. When I was at Reading on Friday 5th, onward arrival times had arrived at the screens but they were still a zone-free zone. I did see that the marks were there along all platforms, odd though that looks at first. I guess that's just the railway's way of working - it's not likely that "any platform that could ever call for an announcement referring to zones" will rule any out.So it wasn't a big bang start of the new passenger information features. I'm not sure you need coach->zone mapping information before you reach the platform, at least not in general. 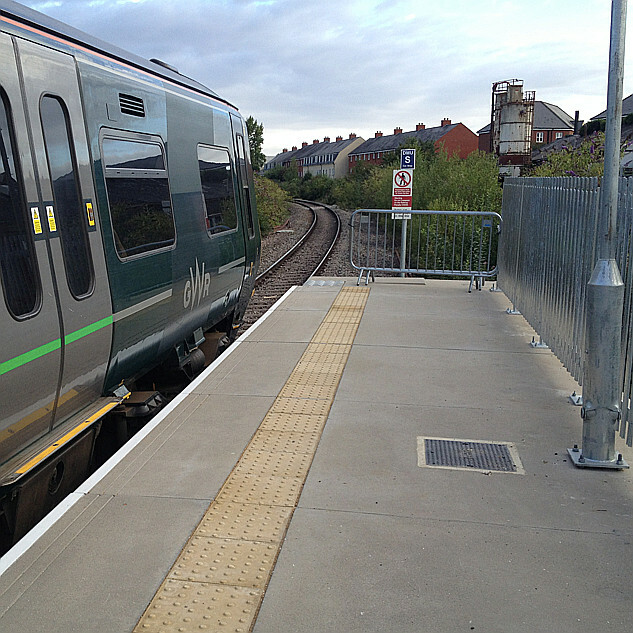 The ideal place for it is on the platform - and if you have enough displays there you don't need the markings do you? But in this respect, Reading isn't general - with two stars down, you might want to know which to use, though that doesn't call for as much detail. There are still two of the old "huge phone" touch screens on the deck, though now demoted to just show NR public information posters in rotation. The one beside the lift up from P7, facing the enquiry desk, is not well sited for arriving passengers, though the other one on the north face of the P15 lift shaft facing Caversham is perhaps not bad for those entering on that side.